Potions and Pastries is the seventh in the Magical Bakery Mystery Series featuring Katie Lightfoot and the ladies of the spellbook club – another name for her informal coven of witches. Katie, her aunt Lucy, and uncle Ben own the Honeybee Bakery in Savannah, Georgia. Katie and Lucy are both hereditary hedgewitches, also known as green witches, and add magically enhanced herbs and spices to their baked goods to benefit their customers. After celebrating the second year of success at the Honeybee with a dinner out, Katie, her fiancé Declan, Ben and Lucy come across Orla Black, a friend who’s a fortune teller. Shortly after Orla hints at something in Katie’s future, she meets with what appears to be a terrible accident. However, between her instincts and a few otherworldly hints, Katie knows it was much more than that. Since the authorities don’t believe foul play was involved in Orla’s death, Katie dives in to track the killer with the help of her friends. In the process, she learns the Black family is a group of Irish travelers, sometimes known as gypsies. They live in a series of connected townhouses and often busk along the busy Savannah riverfront. Their skill set is varied, with a mime, a unicyclist, a ventriloquist, and a hypnotist, as well as fortune telling. Meanwhile, Katie’s tiny carriage house is getting cramped for her and Declan, so they’ve been house hunting the help of fellow-witch and real estate agent, Cookie Rios. The process is difficult for Katie because she loves her home so much. Still, they want to find someplace larger before moving forward with the wedding. Cookie has some new developments in her life, too, as does another spellbook club member, Bianca Devereaux. It was inevitable that one of the Magical Bakery Mysteries would have an Irish connection. After all, there are already several. Katie has Irish blood from her mother, a freckled redhead (her father is Shawnee), and her fiancé, Declan McCarthy is not many generations removed from the Old Country responsible for his surname. Not only that, but Declan is occasionally visited by the spirit of an ancient leprechaun caught in a kind of supernatural purgatory. Can’t get much more Irish than a leprechaun! Savannah also has a strong link to Ireland. The city received an influx of people fleeing the Irish potato famine, and many stayed. Today, there are nearly 200 names in the phone book that begin with O’, and the St. Patrick Day’s Parade in Savannah is the second largest in the United States with more than 400,000 people attending — pretty impressive for a city with a population of just under 150,000! The recipes in the back of Potions and Pastries are for Brown Butter Chocolate Chip Cookies (mmmm!) and, for a savory option, Rhubarb and Ricotta Crostini. 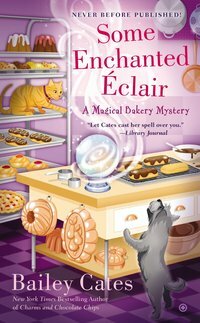 For more information about the Magical Bakery Mysteries, the Enchanted Garden Mysteries I write as Bailey Cattrell, and my other books, please visit http://www.baileycates.com. When the bookshop next to the Honeybee Bakery hosts a signing for a Savannah radio celebrity’s new self-help book, magical baker Katie Lightfoot is happy to provide some delectable desserts. A big crowd has turned out for the event, curious about the book (and maybe to sample some goodies), but the final chapter comes too soon for the author when she is found dead at the event. Bailey Cates believes magic is all around us if we only look for it. She is the New York Times bestselling author of the Magical Bakery mysteries, including Magic and Macaroons; Some Enchanted Éclair; and Charms and Chocolate Chips. 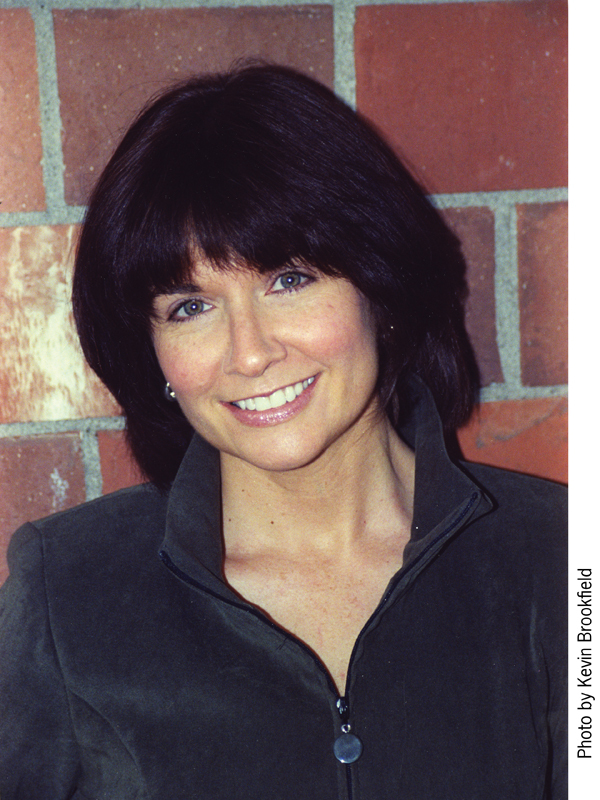 She is also the author of the Enchanted Garden mysteries, which began with Daisies for Innocence, writing as Bailey Cattrell. 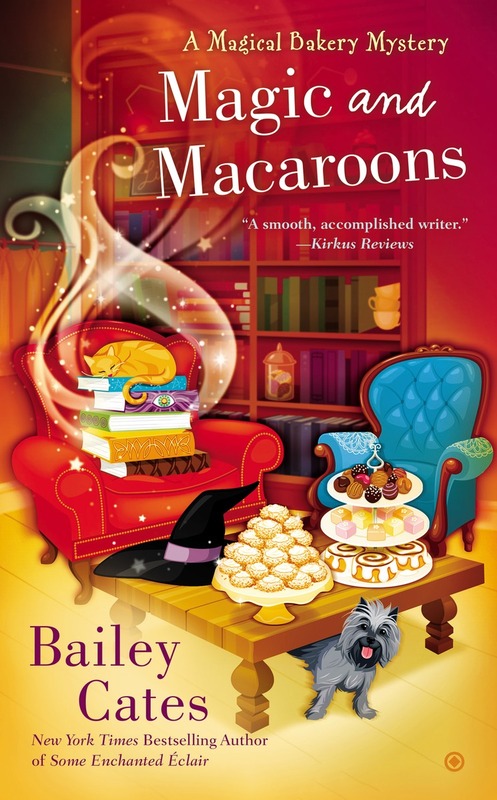 Magic and Macaroons is the fifth Magical Bakery Mystery featuring kitchen witch and one-third owner of the Honeybee Bakery, Katie Lightfoot. Katie has been in Savannah, Georgia for a year and a half now, and is still learning ​about the Craft​ from the members of the spellbook club. Mimsey Carmichael specializes in flower and color magic and dabbles in divination, while Bianca Devereaux focuses on traditional Wiccan spell work and moon magic. Jaida French is a tarot expert, and Cookie Rios — well, she’s a generalist since she turned away from the voodoo she grew up with in Haiti. But Katie’s specialty is hedgewitchery, or green magic, like her aunt Lucy whom she works with in the bakery. Together, they use their special knowledge of herbs and spices to gently bewitch the delicious goodies they bake up at the Honeybee with spells for love, prosperity, health, peace and more. She’s also learned that she’s a lightwitch, and while that might account for why she stumbles into so many murder investigations involving magic, she still doesn’t know exactly what else being a lightwitch entails. Her mentor in that regard, Detective Franklin Taite, is now dead, and she’s waiting for the replacement he promised would show up in her life. As Magic and Macaroons begins, it’s an unseasonably hot August in Georgia, and Katie is battling the heat with cool treats for the Honeybee patrons. But then a meeting of the spellbook club is interrupted by a stranger collapsing on the floor of the bakery, mumbling something about a missing talisman and voodoo queens. Soon an impossibly dead body is added to the mix. 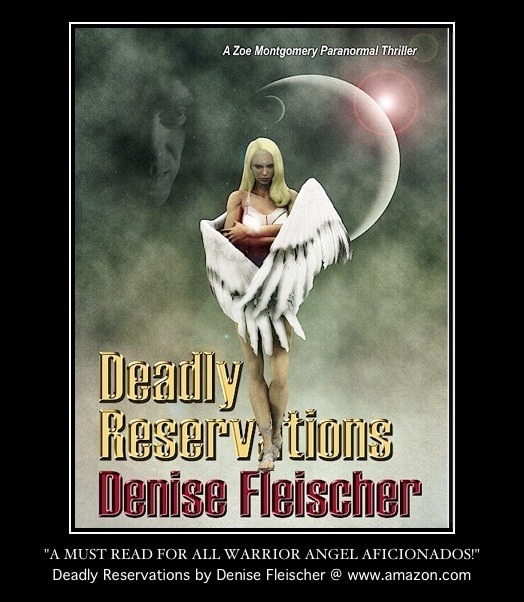 Katie is compelled to investigate, and the first thing she does is enlist a reluctant Cookie Rios’ help to find out more about Savannah’s infamous voodoo queens and the possible uses for the missing talisman. She meets several members of this largely underground community, all quite different, and all possible suspects at first. But they aren’t the only suspects, and with the help of the members of the spellbook club, her boyfriend, Declan McCarthy, Declan’s improbabl​e​ Uncle Connell, and Steve Dawes, Katie tracks the magical killer. I’m fascinated by the different aspects of magic, and how they relate to everything from quantum physics to psychic readings. However, friends became a bit alarmed when I started researching voodoo. It has a reputation for dark magic, for voodoo dolls and curses. I heard quite a few interesting stories during the year I conducted research. ​However, there are many, many flavors of voodoo/voudou/vodou/hoodoo. Almost all are based on West African religions that date back centuries, but many of those have been added to, subtracted from, or altered by local culture. In the end, my goal was to address the magical aspects of voodoo with the respect I try to show all magical or pagan practices in the series. I did a lot of reading (a LOT), and spoke numerous times with a voodoo queen a friend referred me to. She was enormously helpful. This more expansive vision of magic rings true, however you happen to define it in your own life. Besides the spell work side of things, there’s always a lot of food in the Magical Bakery Mysteries! For Magic and Macaroons, I include a recipe for coconut macaroons (what else?). ​My (Katie’s) version is also a ​thumbprint cookie. You can fill the center indentations with any kind of jam, but I also provide recipes for making your own pineapple jam and pomegranate jelly. The other recipe is for Pao de Quiejo, or Brazilian cheese bread. I am completely addicted to these cheese puffs made with tapioca flour, and had to share how super easy they are to make. Next up: Enchanted Garden Mystery #1! This is a new series starting in January of 2016, which I write as Bailey Cattrell. The first one is called Daisies for Innocence (the titles​ reflect the language of flowers) and features perfumer and gardener (miniature fairy gardens!) named Elliana Allbright​. And, of course, ​I’m also working on Magical Bakery Mystery #6, Spells and Scones! 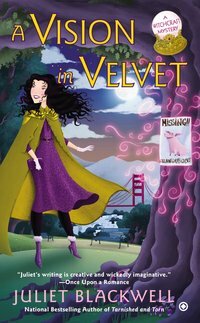 As soon as Lily opens the trunk, she feels strange vibrations emanating from a mysterious velvet cloak. When she tries it on, Lily sees awful visions from the past. And when the antiques dealer who sold her the cape is killed, Lily suspects a supernatural force might be behind his death. Then Lily’s familiar, Oscar the potbellied pig, disappears. Lily will do anything to get him back—including battling the spirit of a powerful witch reaching out from the past. But even with the aid of her grandmother, unmasking a killer and saving Oscar might be more than one well-intentioned sorceress can handle. 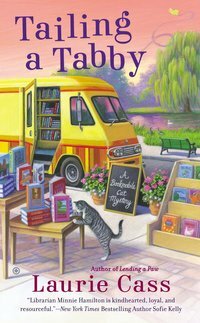 In the bookmobile, librarian Minnie Hamilton and her rescue cat, Eddie, roll out great summer reads to folks all over the lake town of Chilson, Michigan. And when real-life drama turns deadly, Minnie makes sure justice is never overdue. The bookmobile is making its usual rounds when Minnie and Eddie are flagged down by a woman in distress. The woman’s husband, a famous artist, needs emergency medical care. After getting him into the bookmobile, Minnie races the man to the hospital in time…but his bad luck has only just begun. After disappearing from the hospital, the artist is discovered slumped over the body of a murdered woman. Minnie knows that her new friend didn’t commit the crime, but the evidence paints an unflattering picture. Now this librarian and her furry friend have to put the investigation in high gear and catch the real killer before someone else checks out. Newlywed vampires Sarah and Thierry de Bennicoeur have their whole undead lives ahead of them. 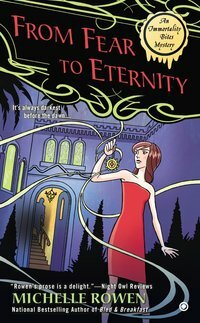 And with Thierry’s job as a consultant for the Ring sending them across the globe to solve one vampire crisis after another, eternity may never have a dull moment. Sarah was hoping the honeymoon would literally last forever, but when Thierry receives a mysterious invitation to an auction held in an old Beverly Hills mansion, it’s clearly time to get back to work. Thierry hopes to win a powerful amulet containing a wish-granting djinn that has eluded him for centuries. Unfortunately, Atticus Kincade, head of the vampire council, also has his eye on the item. When the auction’s host reveals his unpleasant history with Thierry, and Sarah discovers a talking head in the freezer, things get even weirder than usual. But when the amulet goes missing, and everyone is suddenly trapped inside the mansion, the undead guests find themselves in mortal danger—and Sarah had better be careful what she wishes for. When Hollywood invades Savannah’s historic district to film a Revolutionary War movie, magical baker Katie Lightfoot, and her witches’ coven, the Spellbook Club, take a break from casting spells for casting calls. One of the witches snags a part as an extra, while Katie’s firefighter boyfriend, Declan, acts as on-set security. Katie and her aunt Lucy decide to stay out of the action, but after the movie’s “fixer” fires the caterer, the Honeybee Bakery comes to the rescue, working their magic to keep the hungry crew happy. But when someone fixes the fixer—permanently—and a spooky psychic predicts Katie will find the killer, the charming baker and her fellow conjurers step in to sift through the suspects…before someone else winds up on the cutting room floor….